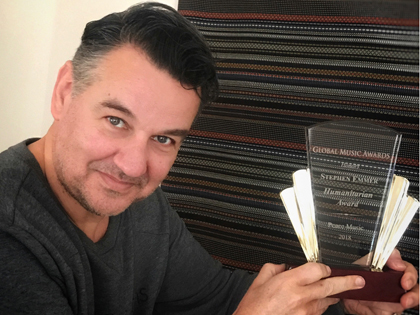 Each year Global Music Awards honors a composer/artist/musician with its annual Humanitarian Award for music dedicated to social justice, humanitarian causes or environmental issues. The 2018 award goes to Stephen Emmer for his contribution to peace and justice for displaced people from around the world. Stephen would herewith like to dedicate the award to War Child, for their relentless dedication in trying to make this world a better place by helping ‘our’ children – the best cornerstone imaginable for a future world at peace. Global Music Awards asked Mr. Emmer about his work. Q: We know you are concerned about the conflicts and division in the world. What goes through your mind when you think of the wars and all the displaced people? A: I have ambivalent thoughts about this, as this has been going on for centuries by now, and that is no reason for direct optimism. Yet, I am hopeful that slowly, through various developments in the fields of information technology, media distribution and new human insights, changes might help accelerate some sort of universal insight that we can only run this planet together. Q: Your album, Home Ground, gives voice to all of us worried about the world and proves that music can be a powerful tool in the fight against oppression. It reminds us of our common humanity and promotes freedom and human rights. Tell us about your album. Why this selection of lyrics and artists? A: In the Obama years of not so long ago, the general social climate was perhaps more steering towards a more emancipated, liberated society, at least in the United States. But I was slightly surprised to notice that around that time there was not that much urgent music around with socially engaged lyrics. That made me wonder why not act on this myself? I started conceptualizing. Meanwhile, I saw the world changing fast: America got a new president, the Middle East situation escalated even further, and in Europe the refugee situation became rather urgent. So suddenly I realized that my lyrical content should try to address or incorporate those issues. I started to think about what artists I could invite to collaborate; great artistical talent but also who had a certain social consciousness. I started searching and I was lucky to find them. It took almost a year to be able to make the full line up for the album. Q: What do you think is the common thread among the artists on your album? A: the common thread among the artists is, I think, their musical passion first and foremost. Also, they engage themselves in projects where a certain concern about the world can be expressed. Each of them has engaged in past projects and has a proven track record of their involvement in society. A: The beauty of this line up of artists is that it goes across generations and beyond being famous and less famous. There is a huge consensus amongst them all to get involved with projects like Home Ground; to keep their integrity intact because of the very nature of this project. I it has to do with artistic integrity and much less with commercial motives. In fact, I can point to their vocal contributions, in all of which you can clearly hear a sincere message in their voices and musical interpretations. The intensity and emotional interpretations on Home Ground show they didn’t treat this project as a mere run of the mill kind of musical exercise but gave it that much needed artistical extra to try and create maximum impact to the listeners. Q: Do you have a background involving humanitarian projects, perhaps in your youth or upbringing? What have been your other charitable activities in the past? A: I lived in Europe, the Far East and in South America in my youth. Later, as an adult, I have lived in America, England and on the European continent. These experiences helped me develop a clearer and perhaps broader then average viewpoint on human society because I saw with my own eyes the huge differences between peoples. But I also what connects them through universal human values, hopes, wishes and opinions. I also believe, in hindsight, that all of this added up to the way I see the world and how I can translate or channel this into artist activities. So yes, I did make an earlier album called, Recitement, where I cross-promoted literature to people of different nationalities by making a soundtrack in various musical genres of world literature in seven different languages. Through this effort I helped fund the writers or their foundations and helped get new audiences globally for foreign literature with an existentialist theme with common threads by setting it to music, the universal language. Then, I did a project to focus on forgotten and hidden poverty amongst elderly people in the United Kingdom by a so called social Christmas song in collaboration with Julian Lennon, the son of John, and donated the proceeds to his White Feather Foundation which is an international humanitarian NGO. LINK By carefully choosing projects in the future I think I will almost certainly do a musical project where the proceeds will be donated to medical research for certain diseases that still have no cure or medical solution. There is still so much work to be done! Q: Which socially engaged artists throughout the years inspired you? A: I always felt attracted to those socially engaged artists that believed in packaging an iron fist in a velvet glove. In other words, don’t shout your message as the aggression because that will diminish the power of your words So, my own taste were people like Curtis Mayfield, Marvin Gaye, Sam Cooke, and Stevie Wonder. Their tone of voice, reached out to larger audiences instead of only preaching to the already converted. You’ve got to reach out and cross over to achieve, is my guess. Q: Do you feel there is something in the air about social consciousness today? Do you see a clear need in the future for protest music? A: Protest music because of current day developments, especially in the United States, is more relevant than ever. I already see more outings of this then say two years ago when I started my project; which is a good thing I think. I would say that it can even have a bigger impact now than in the past because of faster media distribution on a global scale. Imagine if a meaningful social message hit YouTube in the same way as Luis Fonsi’ Despacito ft. Daddy Yankee, for example? LINK I believe this is all still about to happen! Q: What are your hopes and fears for the world? Are there any specific themes you feel are more urgent in the world today then others? A: I feel that we all, if in any way do-able and possible at all, should always try to transcend our own personal situation and try to see how we are collectively doing. Through doing this I think we can try to dismantle the further tribalization of humanity. There are so many different groups opposing to each other that it almost seems that that is the most important thing to do in life, whereas there are some very central themes that probably need to be solved first. I would personally plea for a more open mind from everyone towards the bigger picture first. Self-interest isn’t equal to dignity. Allow me to quote a lyric excerpt by Paul McCartney, “The love you get is equal to the love you give. Q: What advice and suggestions do you have for musicians who want to use their music to fight injustice and foster peace? What are some down-to-earth, practical actions musicians can take to assist a troubled world? A: I think there are many ways, but it all starts with making a clear choice for a subject, topic, theme first that channels well in today’s concerns. Artists have a way of seeing things earlier sometimes. Select something you are concerned about in the future, so you will be able to let this theme reflect in your lyrics. Your next point of action would be to not merely make music for it, but to make that music really resonate what you are trying to express lyrically. Often, in older protest music, I felt that the music merely served as only a vehicle or carrier for the meaning of the lyrics. I feel both lyrics and music should have a far more intrinsic relationship. You can also choose to make intense instrumental music and in that more abstract way find response from people who have difficulties expressing themselves. There are many ways, but as I said I believe in the velvet glove approach most. Next, look for new ways to bring it across by teaming up with socially involved parties, organizations and people. Ask others to join forces to bring the communal message across through, for example, the collective social media channels. There is much to be gained in this by looking further then the artistry alone, you see. Q: When you want to support good causes through your music, would you also be prepared to do tasks outside of music creation? A: Well, yes, I would. I somehow think it must stay linked to the music in whatever form, as then I can offer my best self; but sure, when needed I can step out of the comfort zone and start being helping there. Q: Talk about the lyrics in your album. Once you are moved by an idea or emotion, what is your work method to bring the lyrics to fruition? How do you test your lyrics? A: I think, I read, I wonder, I ponder, I exchange and then sometimes it comes out real fast and sometimes it takes longer. For the Home Ground project, I also collaborated lyrically with Glenn Gregory from England, who always had a keen eye for social injustice as a musician over there. We tested some of the lyrical ideas amongst ourselves and intuitively came to the same likings of them. In the case of the song called Soil, I cowrote the lyric with the performer Ursula Rucker, who is a very eloquent spoken word artist. I came up with the ideas and the words and she made it into the beautiful rhyme it has become. It’s worth noting that you always need to leave room for improvement through working with others. Q: Let’s talk about your career. You have certainly had a remarkable career. How did that come about? What have been your most important musical influences? A: My earliest influences came via my mother who was a ballet and dance teacher. Through her I was influenced at an early age by what music she used for her lessons. It was an eclectic choice where she combined Stravinsky with Dave Brubeck and Carlos Santana. She is 87 now and she and I go to a concert of Middle Eastern music with a Western orchestra. Later, I felt too restricted to stick with one musical genre and started playing in pop, rock, electro, experimental jazz bands in my adulthood. While doing media music I learned to create all kinds of music. But I tend to go back to my original idea of creating a certain music, namely that music needs to reach people on different levels. Music must be accessible for the listener who prefers only one sort of music, and it also needs hidden layers for people who look for that in music. Some of my most important musical influences are: Ennio Morricone, Miles Davis, Gil Evans, Jimi Hendrix, Debussy, Marvin Gaye, Brian Wilson, David Bowie, Ravel, Ryuichi Sakamoto, Scott Walker, Federico Mompou, Milton Nascimento and Heitor Villa Lobos. Q: If you hadn’t chosen music as a career, what do you think you would do right now? A: I would have liked to be a foreign correspondent for a newspaper or magazine; a writer who observes the way of the world or perhaps be a maker of documentaries about human life. Q: Will you try to include humanitarian in all your future projects? A: Yes, I certainly will, as I feel it’s my duty and mission on earth to do so. I have also plans already in the making. Next to that I would also like to help further develop music therapy, which at present, is still in its relative infancy, but could work wonders for people in the future. That’s probably where I’ll be heading later. Q: Are you encouraged or discouraged about the future after having created Home Ground? A: Ambivalent, as earlier stated, but willing to take the Buddhist stance in this: play it by ear and simply go onwards and upward!